Their grip on the Danske Bank Premiership title may be loosening as the weeks go by, but with an Irish Cup final and second place in the table still up for grabs the Crues will not be easing off any time soon. 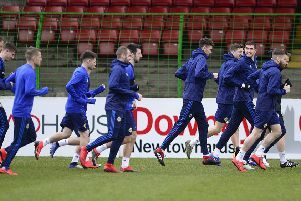 “We have a cup semi-final to look forward to so we’re pleased with our work over the last few weeks and there’s still a lot to work for,” said Baxter after watching his side beat derby rivals Cliftonville 2-0 at Seaview. The Crues showed their battling qualities against the Reds on Saturday, especially after they were reduced to ten men with 20 minutes to go after Rory Hale was shown a second yellow. The hosts held on to claim a valuable three points and close the gap on second placed Ballymena United to five points. “It’s a very pleasing result,” said Baxter. “We got the two goals and looked comfortable. We always looked threatening and they never got in behind us. “We put ourselves under a bit of pressure with the sending off but they had no penetration despite having a lot of the ball. Baxter’s men got off to the perfect start as Jordan Owens headed them in front with only five minutes gone. The Crues top scorer produced a powerful close range header from Jordan Forsythe’s free-kick, which gave Richard Brush no chance. The big striker almost doubled the lead on 19 minutes from another Forsythe delivery, this time though Brush produced an excellent save to deny him. The hosts doubled their lead two minutes before the break, this time it was Kyle Owens who got on the end of a Forsythe set piece. The defender lost his marker to guide a deft flick past Brush. The Crues couldn’t relax just yet though as Gormley flashed a long range free kick inches over after the break, before he had a header hacked off the line by Billy Joe Burns. The visitors were given a glimmer of hope on 71 minutes as Hale was sent off following a late challenge on Jaimie McGovern, but Crusaders saw out the game to pick up the three points. “I’m disappointed with our first-half performance,” said Reds boss Paddy McLaughlin. “Against two set-pieces because we knew they’re strong from set-pieces. Second half we played a lot more and we moved the ball around the pitch. “On another day you get something from the game. 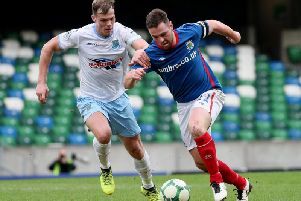 It was McLaughlin’s first experience of a North Belfast derby, and although he was disappointed to lose the game he feels his side are not far away from challenging for honours. “I’ve enjoyed it so far, the boys have been excellent and they’ve really bought into what we’re doing,” he said. “If we keep developing the players, we’ll make the club a force in the league again.